Did you choose your guardian angel? A shimmering image stood at the bottom of Dale Earnhardt Jr.’s bed waiting for Dale to wake up andnotice his brilliant visitor. Then he did. “Who are you? What are you doing here? “You have too many wings to be an angel. Three pair I see. Angels only have two wings. I saw the John Travolta movie Michael. “I am a Seraph. My name is Ralph. We have six wings. Two to cover our face when we accidently land in the bathroom when you are on the john. Two wings are to cover our bodies and feet. Our bodies always get cold flying around and after all, feet are really ugly. The last two are for hovering and flying. There are 9 different angels or 10 if you count the fallen ones. The Seraph handed Dale junior a scroll and vanished as quickly as he had arrived. Ok. He just opened the door he had unlocked and walked out. Dale turned on his bedside light with the #3 on the shade and untied the scroll. There was a list of fourteen names. This was going to be a tough decision. Dale’s eyes closed as he tried to get back to sleep, but his mind clicked on. What kind of questions do you ask a dead person interviewing to be your guardian angel, especially famous ones? The next morning before leaving for the #88 Hendrick Motorsports race track garage, Dale read the list once more and circled four names Nixon, Monroe, Knievel, and Carson. As a successful race car driver, Dale was a “hands on” driver, checking and building his cars. Inside his 66,000 square foot Hendrick Motorsports facility, he slid under the #88 car on a mechanics “lay down dolly”, another dolly slid alongside his. And that is the way it was for Dale the next few days. All the dead famous people he did not pick showed up with the same question “Why not me?” Shaving one day, Dale looked in the mirror and saw the Man in Black. That one almost cost Dale his nose when the razor slipped. A few days later in a warm up test for #88 on turn two Dale looked over at the passenger side of the car and saw Elvis, Foster Grant shades, dressed in a gold sequenced leisure suit. It was a good thing he left in a vapor trail then as the car was beginning to overheat and needed a pit stop. Dale’s crew swarmed the overheating car checking for its cause. His crew chief stuck his head in the car and said. It was Sherman Hensley’s from The Jeffersons, a TV sitcom. His face was on the head of Dale’s crew chief. With that the face of George Jefferson disappeared and Dale’s crew chief’s concerned frown reappeared. It was time for a break as Dale crawled from the car window and headed to the drivers lounge. Dale spent one of those special moments next morning looking at a favorite treasure, a framed picture of his dad and himself surrounded by the trophies they had won racing. He missed his dad. The dad in the picture was speaking to him. Dale thought back to the party night before reassuring himself he just needed to get more sleep. Maybe he had one too many girlfriends. Spinning around, Dale looked to see no one else was in the trophy room. The lips on his dad’s face in the picture stopped moving. Shaking his head to clear the cobwebs Dale headed to his new indulgence, a beautiful pool at the back of the house. It was getting cool in Monroeville, North Carolina in the last days of October. After a few swim laps, Dale stretched out on a lounge chair for a warm up by the sun. “A cup of coffee sure would be good about now.” He said to himself. Dale looked into the sun at the voice standing over his lounge chair. He recognized the face. This interview process was not going to go well. Dale dressed and hurried to his Motorsports shop. Maybe the personnel manager who hired his seventy employees for the shop would have some useful questions. After all, wasn’t choosing a guardian like hiring a mechanic? Entering the office, it was not his personnel manager sitting behind the desk. It was Clark Gable dressed in the white suit he had worn in the movie Gone with the Wind. On Sunday night a good night sleep is often hard to find. This night was no exception for Dale. No sooner than he was under covers in the middle of a yawn there was a blue light and camera flash bulbs goingoff at the bottom of his bed. A blonde woman in a white dress appeared to be having difficulty keeping her dress around her knees as an unknown wind whipped it high. It was Marilyn. “You had many men in your life on earth and left them. Would you leave me in a crisis? Sleep would not come easy that night for Dale, especially when Marilyn Monroe had been in his bedroom. He had one more visitor that night in his dreams. It was the six winged Seraph. It was late in the afternoon of Halloween, October 31st. Evil Knievel was a no show. Dale was heavily involved in race car preparation for the race at Dover on Sunday when his secretary called. In the frantic preparation before a race this was not what Dale needed. He needed to fix on winning on Sunday. Winning had been elusive of late. Oh well, a few minutes with a sponsor meant a few more dollars to pay the race car bills piling up. He opened his office door and was greeted by a man in a red, white and blue star studded fire suit. Last Saturday I attended a 50th Anniversary celebration including a Catholic Mass at a church in Boston, New York. The priest gave a sermon on the Parable of Lazarus and the Rich Man with a description of angels. This seemed to be a message for me as my writing assignment for the week was to be about guardian angels. 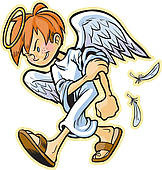 Yes, I believe in angels and guardian angels bringing us messages and keeping us out of trouble. I have learned there are nine types or ranks of angels, ten if you count the fallen ones. They are overseers and deliverers of God’s sentences that are sometimes rewards, punishments or directions. Angels were created by God to fulfill his desires. There are times when angels interact with human beings appearing in a visible or invisible form placing thoughts in our head and even taking on a human form to accomplish a task God assigned. American Indians believe the messages angels bring are often delivered by hawks or other animals in the forest. May we all be of good faith and listen to the messages our Guardian Angel brings. I think my guardian angel is you. You are just in disguise with the title of my husband. Another great story.